When Nick and Sheila Hiller moved into their new home the first thing they wanted to do was to get their flat screen TV installed and hooked up to keep their two little girls entertained while Nick and Sheila set up the furniture and unpacked. 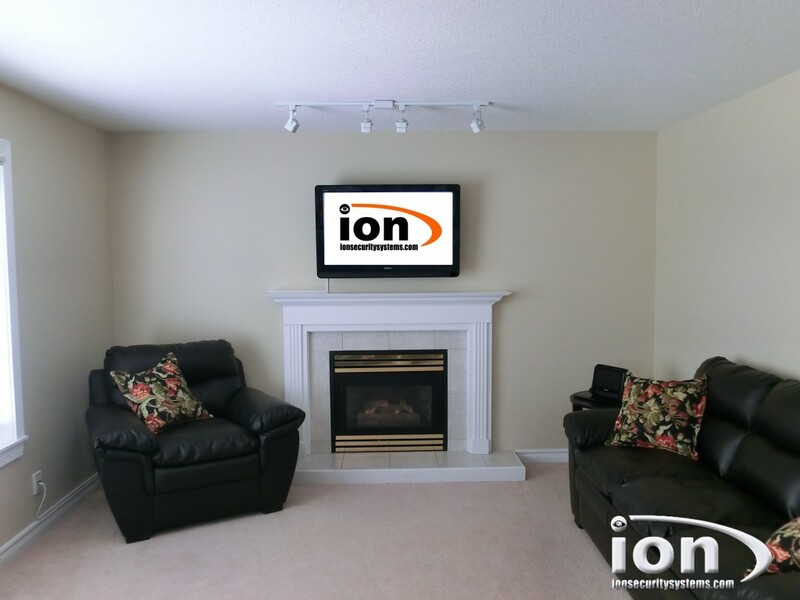 Nick and Sheila searched the web for TV installs in Edmonton and came across Ion Security and Integration. Ion was the logical choice for the Hiller’s since they also wanted to get a Security and Home Automation system installed and Ion was able to do both for them. 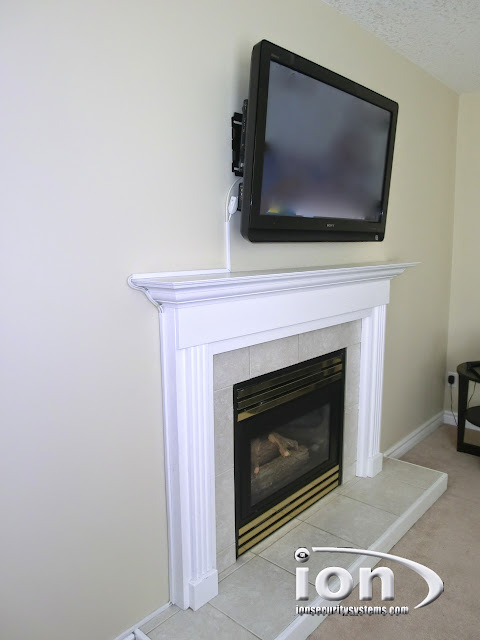 The TV install was pretty common, the Hiller’s wanted their 42” inch Sony LCD TV mounted above the fireplace the only problem was the builder didn’t install power or cable outlets above the fireplace. 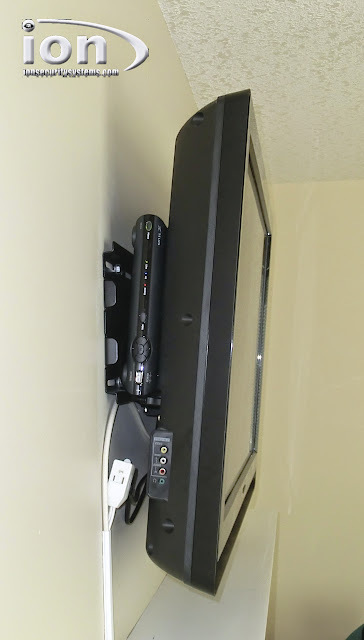 The nearest cable and power outlet was located on an adjacent wall about 11’ feet from where the TV would be installed. Doyle Serink came out to the Hiller’s to do an onsite inspection and explained to Nick and Sheila the two options they had for installing the TV. 1.) Concealed Wiring: Everybody wants the wires to be hidden from view however in this case that meant cutting the drywall, running the wires up and horizontally inside the wall and then repairing, patching, taping and repainting the wall before the TV could be installed. “Sometimes we can run and conceal wiring inside the wall fairly easily says Doyle, unfortunately when we have to run wiring horizontally it almost always requires some sort of drywall repair and painting”. 2.) Surface Wiring with Wiring Duct: The second option is to run the wires on the surface of the wall and conceal them with wiring duct. The wiring duct is ran along side the moldings of the fireplace and parallel to the baseboards. Surface wiring is not quite as nice as concealed wiring but it is a faster option and a lot cheaper. When you’re moving into a new home the budget is always tight so the Hiller’s selected Option 2, Surface Wiring because they wanted the TV installed as soon as possible because of the kids. After we determined which wiring method we were going to use the next question was were to put the high definition cablebox. Once again Doyle gave Nick and Sheila two options. “We can either install the cablebox behind the chair on the floor in the corner or hide it behind the TV out of view. If you want the cablebox behind the TV we need to space the TV out from the wall a little to accommodate the size of the cablebox or if you want the TV mounted as close to the wall then the cablebox would have to go on the floor” Doyle explained. “If you are going to see the side of the TV from a hallway or somewhere in the room I recommend mounting the TV as flat to the wall as possible, Doyle said, In this case the TV will be mounted on the back wall of the room so installing the Telus TV box behind the TV will work good and look fine”. “That’s great news, let’s do that said Sheila, I don’t really want the Telus TV box on the floor”. Doyle went to work installing the wall mount, hanging the TV and running the cabling and wiring duct along the fireplace molding and baseboard. The TV install took three hours after which Doyle began to install the Ion Smart Home Control Security System. Security was the primary reason for installing the Ion Smart Home Control System but equally important was the monitoring and control of the Thermostat and the ability to remotely lock and unlock the front door and garage door. Changing the locks or getting your locks rekeyed is often the first thing a new home owner does and Doyle explains that installing a new Ion Smart Home lock with keypad eliminates the need to call a locksmith and have your locks rekeyed, which can be expensive depending how many keys and locks you need changed. 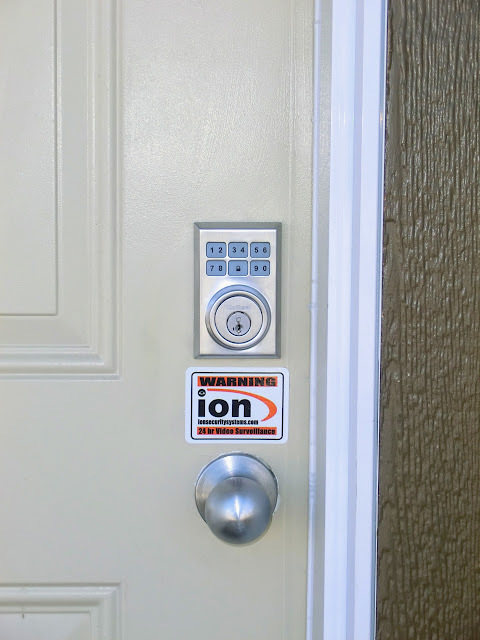 Ion Smart Home locks do not require keys and the key codes can be changed, added or deleted as required. Another benefit of Ion Smart Locks is the ability to remotely lock and unlock the door from your Ion Smart Phone App and to assign times to user codes so the lock code will only work during certain days and times. All this sounds expensive but Ion Smart Door Locks start at only $155 dollars which is about what a locksmith charges to rekey a door lock and provide you with a couple keys. After installing the new smart door locks the next thing to install was the Ion Smart Home garage door control. Just like the smart door lock the Ion Smart home garage door control gives you the ability to open/close and monitoring your garage door from the Ion Smart Phone App. When Doyle was telling the Hiller’s about the Ion Garage Door Controller, Nicks eyes lit up and a smile came to his face as he looked over at Sheila …. do you know how many times she second guesses herself “Did I Close the Garage Door” and then drives back home to check …. this app is Awesome! With the Ion Smart Home Control System install almost finished the last step was to install the Ion Smart Home Thermostat. The Ion Smart home Thermostat costs about the same as a regular programmable thermostat and about have as much as a Nest thermostat yet it provides you internet control, energy saving smart scheduling and internet programming. 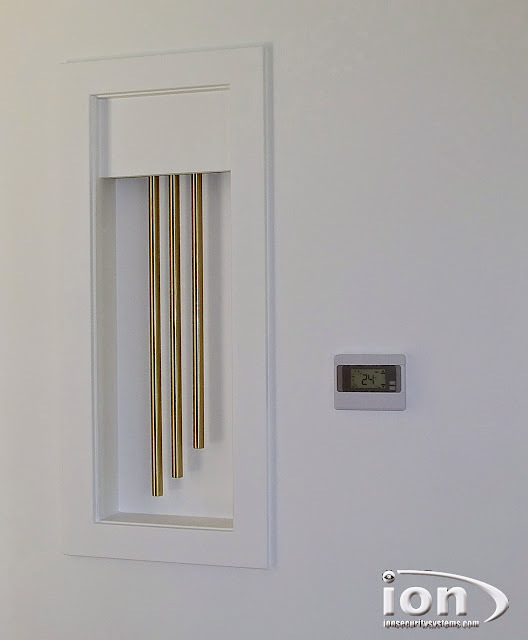 Doyle explains, “Because the thermostat connects to the Ion Smart Home Control Hub it uses all the alarm sensors in the home to know when you’re home and when you’re away and automatically adjusts the thermostat to your desired temperatures saving you money. With natural gas prices increasing 18% in March 2014 the cost savings of the Ion Smart Thermostat can pay for itself in just a couple months. This entry was posted in Installations and tagged alarm system edmonton, edmonton home automation, edmonton smart home, flat screen tv install edmonton, hidden telus tv install, ion security edmonton, keyless entry, plasma tv install edmonton, security system edmonton, smart door lock, smart thermostat, telus tv install, the grange tv install edmonton. Bookmark the permalink.